An important first step in quality improvement is identifying the most frequent occurring problems. On the Analyse-it ribbon tab, in the Statistical Analyses group, click Pareto, and then click Single Pareto Chart. In the Variable drop-down list, select Failure. In the Frequency drop-down list, select Downtime. Select the Label frequencies, Label cumulative frequencies, and Frequency table check boxes. 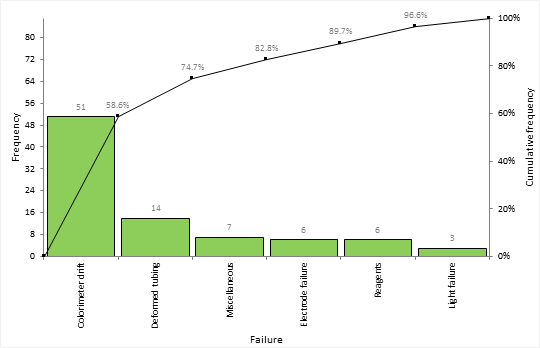 The Pareto plot bars show the amount of downtime spent fixing each failure sorted into descending order. A cumulative line shows the cumulative percentage of downtime. 51 hours (60%) of downtime were spent dealing with colorimeter drift (for example, through recalibration). Colorimeter drift and deformed tubing accounted for nearly 75% of all downtime.